Not that we are fans of monarchy or royal titles and ranks particularly; still when it comes to music, everything is accepted, and we are more than happy to pay our homage to the court of queens enriching it. So, when they told us that the “Queen of nu-cumbia” was ready to publish a new album and visit London for a show (at Rich Mix on 26th April, part of La Linea Festival), we picked up the phone and had a chat with her. That’s how we had an update on the career of Argentinian singer/songwriter Mariana Yegros (better known as La Yegros), starting with her third release Suelta (‘loose’ or ‘free’ in English), which, as the title suggests, is a declaration of intent and a perfect epitome of La Yegros and her music. “Suelta has an important meaning for me. I feel like it’s a word that reflects what I am and this particular period of my life. Then, it’s a word that mirrors my music and the way I play it. Also, when considering its concept, Suelta appears different from the previous works of La Yegros. “The new album is more folkloric than the first and second ones, which have a clearer electronic character. When I was writing Suelta, I was also inspired by nature and its sounds, so you can feel the Andean wind in it, for example. When it comes to its sound and arrangements, Suelta is more complex than ever. The reason has to be looked for in the pool of music wizards who worked on it. Talking about collaborations, ‘Tenemos Voz’, the latest single extracted from the album, enjoys the voice and character of Soom T, a musician who (despite the different style played) shares La Yegros’ attitude and approach to music. Videoclips are an essential means of expression for La Yegros’ artistry. An example is the ‘Viene de Mi’ clip, which contributed to the success of the tunes. Arguably, the same will happen with the aforementioned ‘Tenemos Voz’ or the first single extracted from Suelta, ‘Linda la Cumbia’. As it should be, when chatting with La Yegros, her native country is always a constant presence. That happens when you delve into her music listening too. Next to some good-and-proper ‘saudade’ (sorry for the Portuguesism), there are many other meaningful subjects touched on in the album. A crucial one, as often happens in La Yegros’ songs, is related to the women and their social condition. “In Suelta, I touch on different themes; one of them, in the song with Soom T, is about women’s empowerment. I can see that, little by little, women are finally positioning themselves in the places and roles they always deserved. However, it’s also evident that women are still suffering from abuse. That’s why I wanted to focus on this topic and speak openly about it. 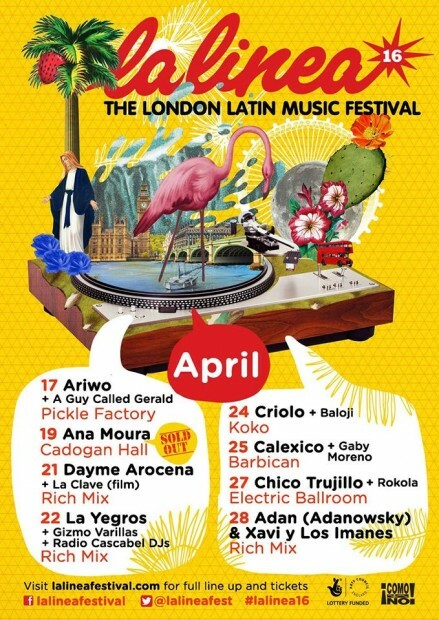 On 5th May, La Yegros will travel back to London (where she last played in 2018) for one of the highlights of the 2019 edition of La Linea Festival. “We played in London last year, and we loved how the audience received us. It was quite a surprise to be honest. So, I hope that they will do the same in May when we will play at Rich Mix. You always look for a bond, a connection with the audience when you play live and, in my experience, that comes from playing joyful and colorful Latin music. That’s what I look forward to transmitting to them. La Yegros made no secret that the live dimension is the one filling her head and thoughts at the moment.